It takes violence of unprecedented levels for Syria to be newsworthy at the moment. Perhaps understandable for a conflict entering its seventh year, longer than WWII. But that cannot be an excuse for ignoring the desperate need of those whose lives continue to be shattered. Idlib, northwest Syria, is facing some of the fiercest fighting seen in the last year, as Syrian government forces advance and clash with armed groups. With the addition of a new front opening up from the Turkish border into Afrin, the need is now extremely urgent. Displaced people whose lives and homes have already been devastated and who have moved – perhaps several times – must now do so again. Recent reports show numbers of 325,443 displacements in north-western Syria and that number is set to rise with the uptake in fighting. An already deteriorated health system is crumbling as hospitals and clinics are hit, precisely when they are most needed. Two of the projects we fund have been struck (one a Primary Health Clinic), resulting in their temporary shutdown. Fortunately, none of the staff we support were hurt, but others sadly were. What this means is that we are helping in exactly the right place and must continue to do so. 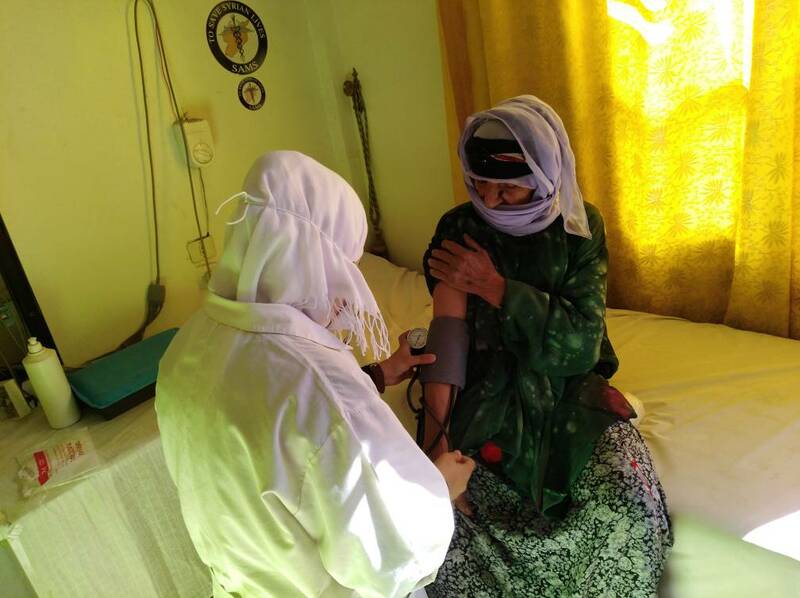 Over the next three months (minimum) we are funding two projects providing vital health services to those in need; a Prosthetic Limb Clinic providing limbs to the wounded without charge and a team of doctors and nurses at a Primary Health Clinic who have stayed, against all the odds, to serve their community. Both of these are inside Syria and run by Syrians. These projects are life-saving and life sustaining and are only possible because of the dedication of the staff whose salaries we fund. We are inspired by their resilience and bravery in spite of the challenges, and we will continue to support them while they are able to safely and reliably implement these projects. These funds will go towards a prosthetic limb clinic in Bab al Hawa, on the Turkish Syrian Border. This clinic manufactures and fits prosthetic limbs for those whose lives have been immeasurably changed by disability. We have supported this project for the last three years, and in 2018 they are expanding to produce better quality prosthetics and expect to produce and fit around 190 per month, double the monthly average in 2017. The limbs are issued to patients free of charge and treatment includes rehabilitation. The aim is always to get patients back on their feet, back to work, or simply able to move around with more ease, pride and dignity. Before the clinic was caught in an explosion in January 2018 the staff had provided 44,000 consultations (18,000 of which were children) between March and December 2017. Hands Up funds the salaries of 22 staff, including doctors, nurses, guards and cleaners, each month as well as the costs required for them to do their jobs. The total to continue this project for a further three months in a new building is £37,500. Gift aid increases your donation by 25%, or £0.25 in every £1. If you don’t donate on Mydonate and if you are a UK taxpayer, please download and fill out a Gift Aid form and return us a copy (email or post is fine). £0.80 in each £1 donated will go to the two projects mentioned above, and £0.20 in every £1 donated will be used to cover the costs of this appeal. Keeping this figure as low as possible is extremely important to us, but there are no short cuts to delivering funds reliably to aid projects in Syria.